The Alder and Least Flycatchers are so much alike that even experienced observers cannot rely on their minor differences for positive identification. 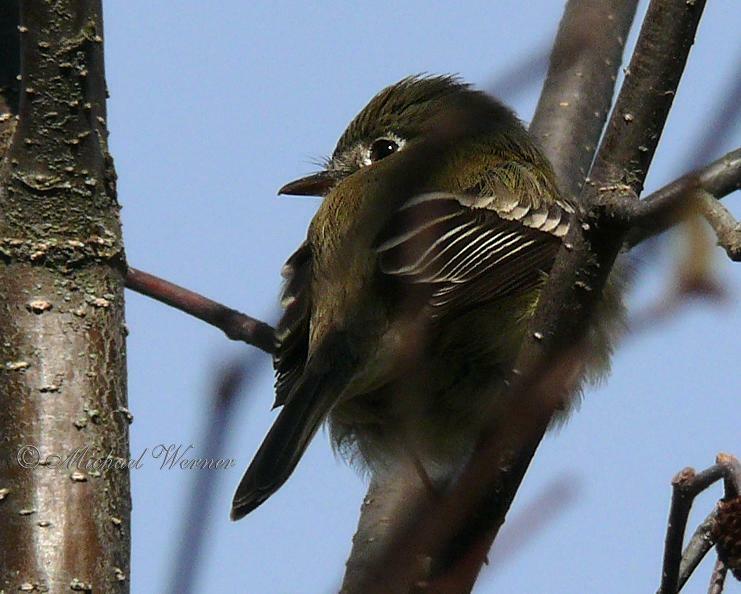 The voices of all the Empidonax flycatchers are completely different and this one's is the easiest to learn and remember. It is an emphatic chebeck, repeated as often as once per second. With each chebeck it flicks its tail and throws its head back. In the fall, when they are wearing their drabber fall plumage and not singing, it is almost impossible to tell them apart. The Least has a wide nesting range in Canada, from the Mackenzie River Valley and central British Columbia to Nova Scotia. Its choice of acceptable habitat is wider than that of most other flycatchers and it is therefore more widely distributed and more likely to be seen. In unsettled areas it is found in open woodland with scattered coniferous and deciduous trees, at forest edges and in sunny openings in the forest. It is seldom found in dense forest. It is also common in farming country and in parks and gardens of urban areas.